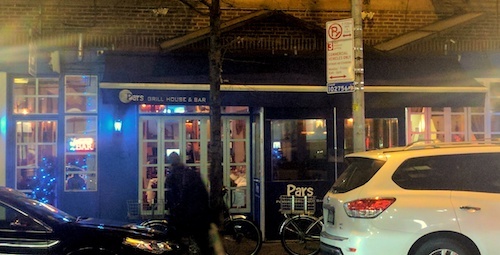 Like most Persian restaurants in the area, Pars Grill House is a little more upscale than most places written about here on these pages. Tables are preset and have white tablecloths, wine glasses are at the ready. Service here is basic and efficient, but one older gentleman made up for this anonymity with constant smiles and friendliness. He seemed to be doting on our table, but closer inspection showed he did it for everyone. 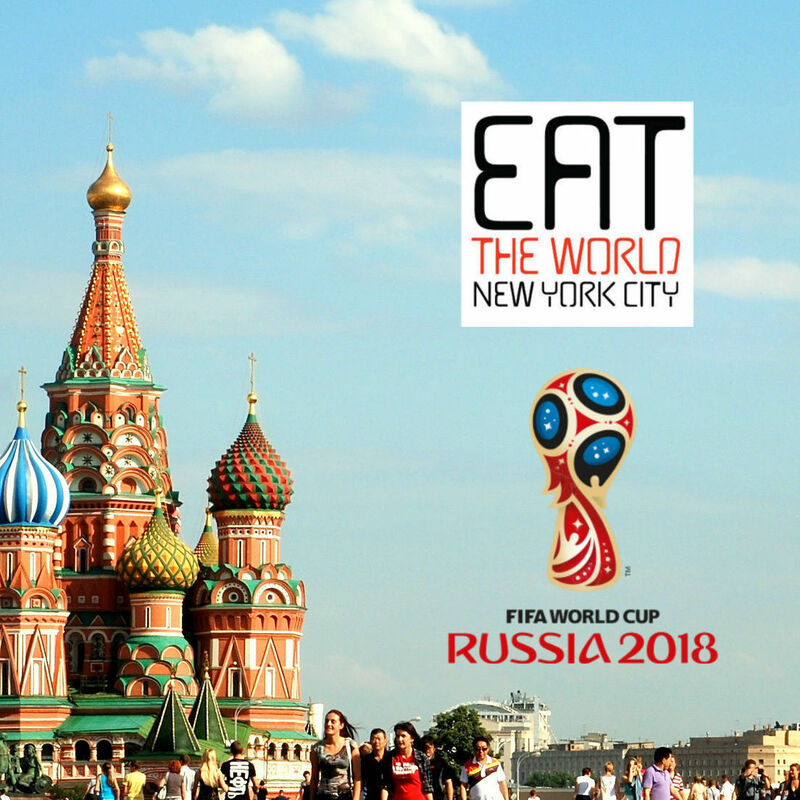 The music soundtrack comes and goes between traditional and non, while the decor is sparse, a few plates are mounted on columns and some unused hookah pipes color an otherwise white room. The restaurant has the look of once being a Greek taverna that had its upholstery updated to become a Persian restaurant. And surprisingly for a Persian restaurant, there is a full bar. Taftan can come in a few different ways, sometimes with sesame seeds or topped with saffron and/or cardamom, but is always enjoyable. Pars' relatively plain version of the Persian bread is served with any order, and came to the table at the same time as the appetizers. Breaking off small pieces affords the opportunity to dip and collect the maast o moosir ($7.95, above left), a yogurt blend with shallots, and kashk-e bademjan ($8.45, above center), eggplant with walnuts, garlic, mint, and topped with whey. We also tried the torshi ($7.95, above right), mixed pickled vegetables in vinegar. Overall the sizes of these appetizers were fairly small, and the restaurant does not seem to refill the basket of taftan, so the table of six was quite eager for the next rounds to arrive. 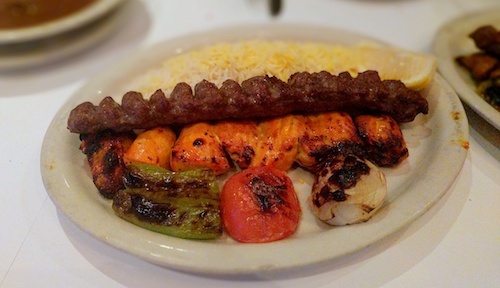 The list of kabob options runs for a page and a half of the menu, giving choices for almost any meat. 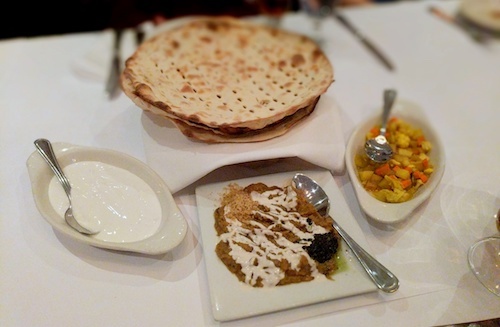 The table looked fondly at the soltani-joojeh ($25.95, below), which had cornish hen and one koobideh, ground beef and lamb. Any grill plate comes with a healthy portion of saffron basmati rice, and a couple grilled vegetables. 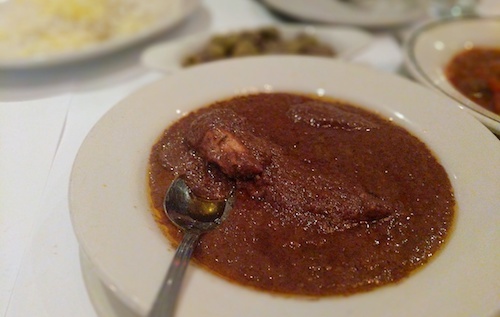 The koobideh stands head and shoulders above the competition, full of onions and spices minced with the two meats. 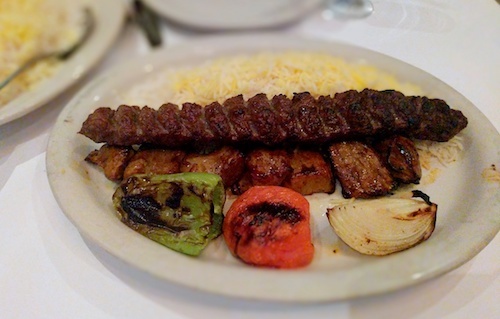 It was a wise decision to include it in the second plate as well, the soltani-lamb shish kabob ($24.95, below). The lamb paired very nicely to the green pepper sauce. 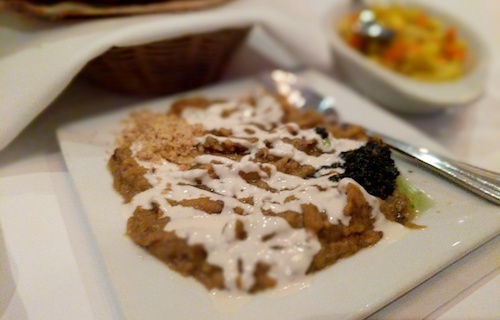 One of the most unique dishes in Persian cuisine is fesenjan ($17.95, below), a walnut and pomegranate stew often served with chicken. It is always sweet by nature, but the version here was even more so. This was not a negative, and the stew tops a healthy portion of the saffron basmati rice very well. 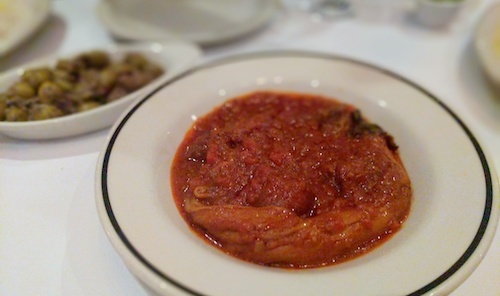 Bademjan ($17.95, below) was new to me, an eggplant stew with beef cubes that has a lot of sourness from both lemon and sour grapes. The eggplant was whole and required a knife to cut up parts for sharing, but also paired well with the rice. Stews are good options for diners who come solo. 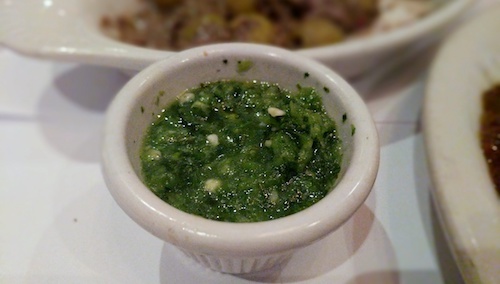 The friendly man brought some of this sauce out and said it goes well on the meats. He was spot on, and the tastes from this little cup included green chilis, cilantro, garlic, scallions, olive oil, and lemon. He also brought a plate of delicious spicy olives (above, left) as we were starting to dig in. 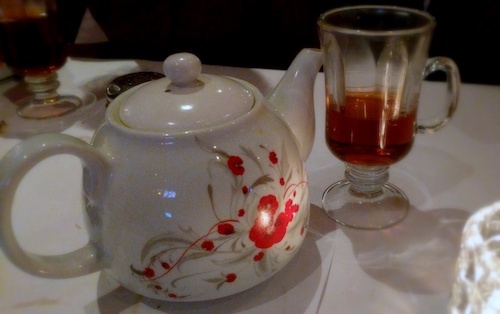 After the meal, the table ordered some coffee (poor) and a pot of saffron tea (good). Saffron is always a theme in Persian kitchens, and shows up a lot despite its expense. Cubes of sugar are plentiful if you prefer your tea as they would in Iran. 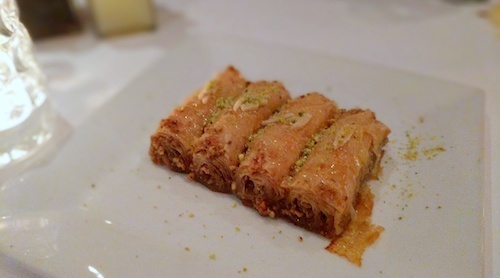 The baklavah ($7.95, above) is good but very heavy with honey. The falludeh with ice cream ($9.95, below) is worth an order if you are new to ice cold noodle desserts. 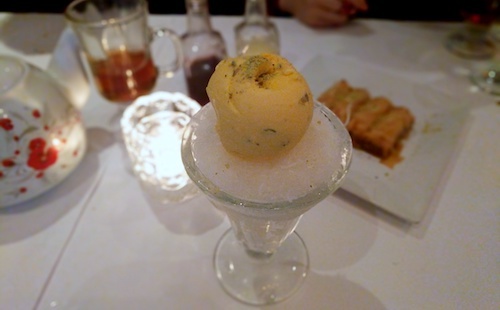 Lemon and cherry syrups are brought to the table for use with the falludeh, while the Persian ice cream can stand on its own with a strong rosewater taste.